Unlike the Noble Chafer, Gnorimus nobilis RDB2, which I first found in Defford in June 1985, a genuine resident, this recent arrival, a striking red longhorn beetle, cannot be claimed as a Worcestershire record. 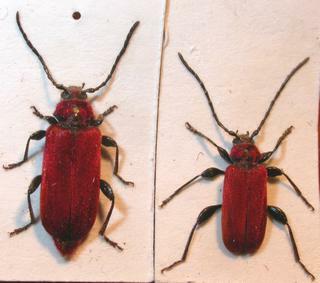 Several specimens of Pyrrhidium sanguineum (L. 1758) RBD2 emerged from a large box of oak logs by the fireside in a neighbour’s lounge over a ten day period around 17th March 2006. Many more logs stored outside may well yield further specimens (Tiddesley Wood is only one mile away). Enquiries have revealed that the logs came from a woodland on the edge of Wyre Forest just outside the Worcestershire VC37 boundary in Shropshire. The beetle is known to be native in a small area of the Welsh Marches and it has been recorded in Moccas Park and near Brampton Bryan Park in Herefordshire. It develops in fallen oak boughs and will utilise cut logs very readily. Pyrrhidium sanguineum male (right) and female (left) that emerged from oak logs originating in Wyre Forest and brought to Defford, near Pershore, for firewood.